July 30 marked World Day Against Human Trafficking in Persons which begun in 2014 to raise awareness and encourage the international community to take action against human trafficking, while many Papua New Guineans may think that this is an international issue this is far from the truth from what is happening within our own borders. 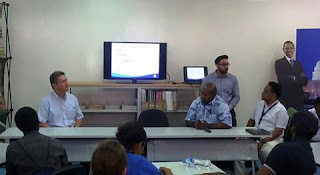 During a forum held today facilitated by PNG’s National Human Trafficking Committee and the US Embassy, made up of partners and stakeholders including International Organisation of Migration (IOM), Department of Justice & Attorney General (DJAG) Lawyers from the Public Solicitors office and Police spoke about the work that’s been done in country to combat Human Trafficking and the challenges faced in combating this issue. “One of the biggest challenges that is faced in my line of work is getting stakeholders to work together, often being a foreigner when trying to do my job, it is always a sensitive issue when I want to for example go down to interview an illegal fisherman that has been caught by police often I have to be careful as to what I say and how I say it” said Program Coordinator for IOM Khalil Omarshah. Mr Omarshah also revealed that the work of IOM has seen two bills created, the Nationals Action Plan (NAP)and the Standard Operating Procedure’s (SOP’s) presented before the National Executive Council (NEC) on the 31st of March 2016 which is awaiting NEC’s approval to be passed in parliament. While it’s good to see progress in this regard these legislations into Human Trafficking needs to be passed soon and should not be left in Parliament to be debated upon for a long time. “ While it’s encouraging to see legislation taking place this needs to be done quickly as it takes longer to do the internalisation, it may be good to have all the training and the knowledge but we need to now practically apply it”, added Mr. Omarshah.